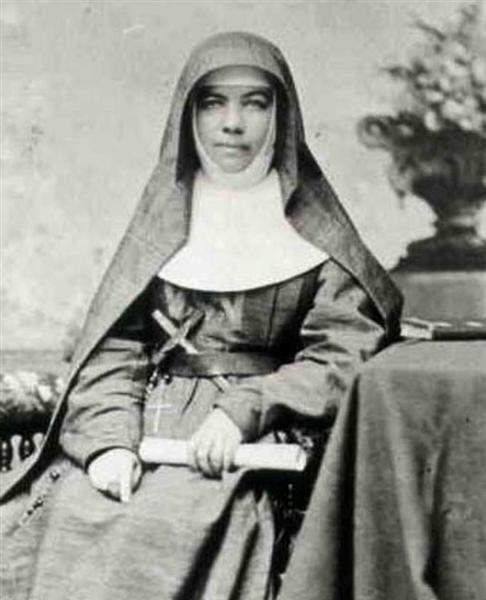 Mary Helen MacKillop was born on 15 January 1842 in what is now the Melbourne suburb of Fitzroy, Victoria (at the time part of an area called Newtown in the then British colony of New South Wales) to Alexander MacKillop and Flora MacDonald. Although she continued to be known as “Mary”, when she was baptised six weeks later she received the names Maria Ellen. MacKillop’s parents lived in Roybridge, Inverness-shire, Scotland, prior to emigrating to Australia. 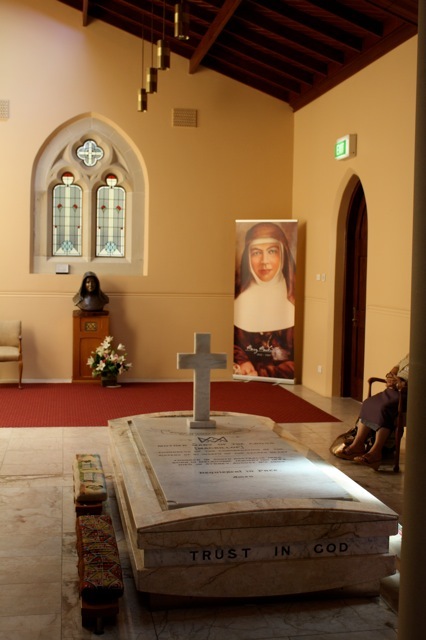 MacKillop visited the village in the 1870s where the local Catholic church, St Margaret’s, now has a shrine to her. MacKillop’s father, Alexander MacKillop, born in Perthshire, had been educated at the Scots College in Rome and at Blairs College in Kincardineshire, for the Catholic priesthood but at the age of 29 left, just before he was due to be ordained. He migrated to Australia and arrived in Sydney in 1838. MacKillop’s mother, Flora MacDonald, born in Fort William, had left Scotland and arrived in Melbourne in 1840. Her father and mother married in Melbourne on 14 July 1840. MacKillop was the eldest of their eight children. Her younger siblings were Margaret (“Maggie”, 1843–1872), John (1845–1867), Annie (1848–1929), Alexandrina (“Lexie”, 1850–1882), Donald (1853–1925), Alick (who died at 11 months old) and Peter (1857–1878). Donald became a Jesuit priest and worked among the Aborigines in the Northern Territory. Lexie also became a Josephite. MacKillop was educated at private schools and by her father. She received her First Holy Communion on 15 August 1850 at the age of eight. In February 1851, Alexander MacKillop left his family behind after having mortgaged the farm and their livelihood and made a trip to Scotland lasting some 17 months. Throughout his life he was a loving father and husband but never able to make a success of his farm. Most of the time the family had to survive on the small wages the children were able to bring home. MacKillop started work at the age of 14 as a clerk in a stationery store in Melbourne. To provide for her needy family, in 1860 she took a job as governess at the estate of her aunt and uncle, Alexander and Margaret Cameron in Penola, South Australia where she was to look after their children and teach them. Already set on helping the poor whenever possible, she included the other farm children on the Cameron estate as well. This brought her into contact with Fr Woods, who had been the parish priest in the south east since his ordination to the priesthood in 1857 after completing his studies at Sevenhill. MacKillop stayed for two years with the Camerons before accepting a job teaching the children of Portland, Victoria in 1862. Later she taught at the Portland school and after opening her own boarding school, Bay View House Seminary for Young Ladies, now Bayview College, in 1864, was joined by the rest of her family. Fr Woods had been very concerned about the lack of education and particularly Catholic education in South Australia. In 1866, he invited MacKillop and her sisters Annie and Lexie to come to Penola and to open a Catholic school. Woods was appointed director of education and became the founder, along with MacKillop, of a school they opened in a stable there. After renovations by their brother, the MacKillops started teaching more than 50 children. At this time MacKillop made a declaration of her dedication to God and began wearing black. On 21 November 1866, the feast day of the Presentation of Mary, several other women joined MacKillop and her sisters. 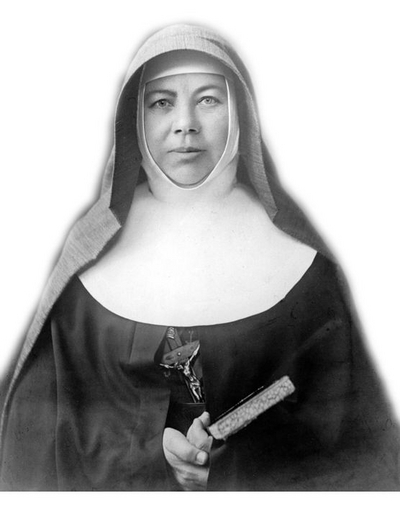 MacKillop adopted the religious name of Sister Mary of the Cross and she and Lexie began wearing simple religious habits. The small group began to call themselves the Sisters of St Joseph of the Sacred Heart and moved to a new house in Grote Street, Adelaide. There they founded a new school at the request of the bishop, Laurence Bonaventure Sheil OFM. Dedicated to the education of the children of the poor, it was the first religious institute to be founded by an Australian. The “Rule of Life” developed by Woods and MacKillop for the community emphasised poverty, a dependence on divine providence, no ownership of personal belongings, faith that God would provide and willingness to go where needed. The “Rule of Life” was approved by Bishop Sheil. By the end of 1867, ten other women had joined the Josephites, who adopted a plain brown religious habit. Due to the colour of their attire and their name, the Josephite sisters became colloquially known as the “Brown Joeys”. In an attempt to provide education to all the poor, particularly in rural areas, a school was opened in Yankalilla, South Australia, in October 1867. By the end of 1869, more than 70 members of the Sisters of St Joseph were educating children at 21 schools in Adelaide and the country. MacKillop and her Josephites were also involved with an orphanage; neglected children; girls in danger; the aged poor; a reformatory (in Johnstown near Kapunda); and a home for the aged and incurably ill. Generally, the Josephite sisters were prepared to follow farmers, railway workers and miners into the isolated outback and live as they lived. In December 1869, MacKillop and several other sisters travelled to Brisbane to establish the order in Queensland. They were based at Kangaroo Point and took the ferry or rowed across the Brisbane River to attend Mass at St Stephen’s Cathedral. Two years later, she was in Port Augusta, South Australia for the same purpose. The Josephite congregation expanded rapidly and, by 1871, 130 sisters were working in more than 40 schools and charitable institutions across South Australia and Queensland. Bishop Sheil spent less than two years of his episcopate in Adelaide and his absences and poor health left the diocese effectively without clear leadership for much of his tenure. This resulted in bitter factionalism within the clergy and disunity among the lay community. After the founding of the Josephites, Sheil appointed Woods as director general of Catholic education. Woods came into conflict with some of the clergy over educational matters and local clergy began a campaign to discredit the Josephites. As well as allegations of financial incompetence, rumours were also spread that MacKillop had a drinking problem. In fact, it was widely known that she drank alcohol on doctor’s orders to relieve the symptoms of dysmenorrhea, which often led to her being bedridden for days at a time. A 2010 investigation by the Revd Paul Gardiner, chaplain of the Mary MacKillop Penola Centre, found no evidence to support these allegations. In early 1870, MacKillop and her sister Josephites heard of allegations that Keating, of Kapunda parish to Adelaide’s north, had been sexually abusing children. The Josephites informed Father Woods, who in turn informed the vicar general Father John Smyth, who ultimately sent Keating back to Ireland. The reason for Keating’s dismissal was publicly thought to be alcohol abuse. Keating’s former Kapunda colleague, Father Charles Horan OFM, was angered by Keating’s removal and there is evidence to suggest he sought revenge against Woods by attacking the Josephites. Horan became acting vicar general after the death of Smyth in June 1870 and from this position sought to influence Bishop Sheil. Horan met with Sheil on 21 September 1871 and convinced him that the Josephites’ constitution should be changed; the following day, when MacKillop apparently did not accede to the request, Sheil invalidly excommunicated her, citing insubordination as the reason. Though the Josephites were not disbanded, most of their schools were closed in the wake of this action. Forbidden to have contact with anyone in the church, MacKillop lived with a Jewish family and was also sheltered by Jesuit priests. Some of the sisters chose to remain under diocesan control, becoming popularly known as “Black Joeys”. After the acquisition of the Mother House in Kensington in 1872, MacKillop made preparations to leave for Rome to have the “Rule of Life” of the Sisters of St Joseph officially approved. MacKillop travelled to Rome in 1873 to seek papal approval for the religious congregation and was encouraged in her work by Pope Pius IX. The authorities in Rome made changes to the way Josephite sisters lived in regards to their commitment to poverty and declared that the superior general and her council were the authorities in charge of the congregation. They assured MacKillop that the congregation and their “Rule of Life” would receive final approval after a trial period. The resulting alterations to the “Rule of Life” regarding ownership of property caused a breach between MacKillop and Woods, who felt that the revised document compromised the ideal of vowed poverty and blamed MacKillop for not getting the document accepted in its original form. Before Woods’ death on 7 October 1889, he and MacKillop were personally reconciled, but he did not renew his involvement with the congregation. While in Europe, MacKillop travelled widely to observe educational methods. During this period, the Josephites expanded their operations into New South Wales and New Zealand. MacKillop relocated to Sydney in 1883 on the instruction of Bishop Reynolds of Adelaide. When Mackillop returned to Australia in January 1875, after an absence of nearly two years, she brought approval from Rome for her sisters and the work they did, materials for her school, books for the convent library, several priests and most of all, 15 new Josephites from Ireland. Regardless of her success, she still had to contend with the opposition of priests and several bishops. This did not change after her unanimous election as superior general in March 1875. The Josephites were unusual among Catholic church ministries in two ways. Firstly, the sisters lived in the community rather than in convents. Secondly the congregation’s constitutions required administration by a superior general chosen from within the congregation rather than by the bishop, which was uncommon in its day. However, the issues which caused friction were that the Josephites refused to accept government funding, would not teach instrumental music (then considered an essential part of education by the church) and were unwilling to educate girls from more affluent families. This structure resulted in the sisters being forced to leave Bathurst in 1876 and Queensland by 1880 due to the local bishops’ refusal to accept this working structure. Not withstanding all the trouble, the congregation did expand. By 1877, it operated more than 40 schools in and around Adelaide, with many others in Queensland and New South Wales. With the help from Benson, Barr Smith, the Baker family, Emanuel Solomon and other non-Catholics, the Josephites, with MacKillop as their leader and superior general, were able to continue the religious and other good works, including visiting prisoners in jail. After the appointment of Roger Vaughan as Archbishop of Sydney in 1877, life became a little easier for MacKillop and her sisters. Until his death in 1882, the Revd Joseph Tappeiner had given MacKillop his solid support and, until 1883, she also had the support of Bishop Reynolds of Adelaide. After the death of Vaughan in 1883, Patrick Francis Moran became archbishop. Although he had a somewhat positive outlook toward the Josephites, he removed MacKillop as superior general and replaced her with Sister Bernard Walsh. Pope Leo XIII gave official approval to the Josephites as a congregation in 1885, with its headquarters in Sydney. He gave the final approval to the Sisters of Saint Joseph of the Sacred Heart in 1888. Although still living through alms, the Josephite sisters had been very successful. In South Australia, they had schools in many country towns including, Willunga, Willochra, Yarcowie, Mintaro, Auburn, Jamestown, Laura, Sevenhill, Quorn, Spalding, Georgetown, Robe, Pekina, Appila and several others. MacKillop continued her work for the Josephites in Sydney and tried to provide as much support as possible for those in South Australia. In 1883 the order was successfully established at Temuka in New Zealand, where MacKillop stayed for over a year. In 1889 it was also established in the Australian state of Victoria. During all these years MacKillop assisted Mother Bernard with the management of the Sisters of St Joseph. She wrote letters of support, advice and encouragement or just to keep in touch. By 1896, MacKillop was back in South Australia, visiting fellow sisters in Port Augusta, Burra, Pekina, Kapunda, Jamestown and Gladstone. That same year, she travelled again to New Zealand, spending several months in Port Chalmers and Arrowtown in Otago. During her time in New Zealand with the Sisters of St Joseph, a school was established in the South Island. In 1897, Bishop Maher of Port Augusta arranged for the Sisters of St Joseph to take charge of the St Anacletus Catholic Day School at Petersburg (now Peterborough). MacKillop founded a convent and base for the Sisters of St Joseph in Petersburg on 16 January 1897. “On January 16th, 1897, the founder of the Sisters of St Joseph of the Sacred Heart, Mother Mary of the Cross, arrived in Petersburg to take over the school. She was accompanied by Sister Benizi (who was placed in charge of the school), Sister M. Joseph, Sister Clotilde and Sister Aloysius Joseph. They were met at the station by Rev. Father Norton who took them to the newly blessed convent, purchased for them on Railway Terrace.” The property at 40 Railway Terrace is identified as the convent by a plaque placed by the Catholic diocese of Peterborough. After the death of Mother Bernard, MacKillop was once more elected unopposed as superior general in 1899, a position she held until her own death. During the later years of her life she had many problems with her health which continued to deteriorate. She suffered from rheumatism and after a stroke in Auckland, New Zealand in 1902, became paralysed on her right side. For seven years, she had to rely on a wheelchair to move around, but her speech and mind were as good as ever and her letter writing had continued unabated after she learned to write with her left hand. Even after suffering the stroke, the Josephite nuns had enough confidence in her to re-elect her in 1905. MacKillop died on 8 August 1909 in the Josephite convent in North Sydney. The Archbishop of Sydney, Cardinal Moran, said that: “I consider this day to have assisted at the deathbed of a Saint.” She was laid to rest at the Gore Hill cemetery, a few kilometres up the Pacific Highway from North Sydney. After MacKillop’s burial, people continually took earth from around her grave. 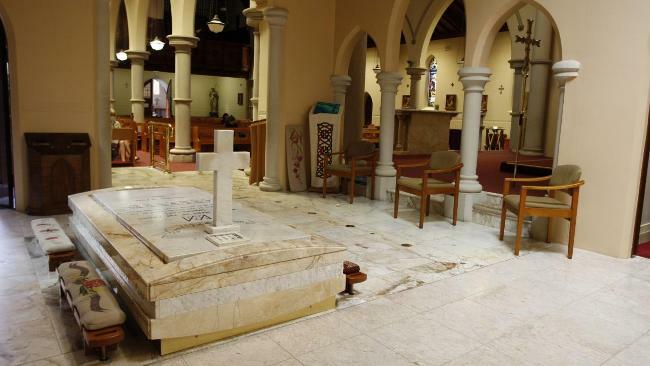 As a result, her remains were exhumed and transferred on 27 January 1914 to a vault before the altar of the Virgin Mary in the newly built memorial chapel in Mount Street, North Sydney. The vault was a gift of Joanna Barr Smith, a lifelong friend and admiring Presbyterian.